You should have experience working with C# or Visual Basic, and with .NET Framework. 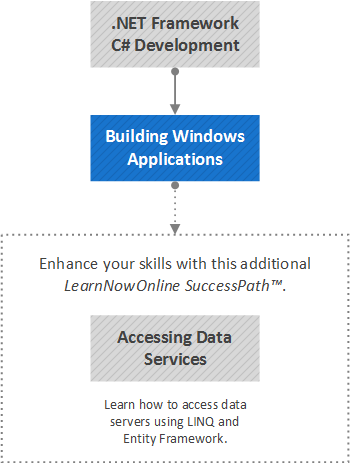 This path will get you started with Windows application development. You will learn how to use Visual Studio and the .NET Framework to make it easier to build rich, robust, enterprise-level Windows desktop applications. You will be introduced to LINQ and the new client-side data support, as well as WMI, WCF, working with DataGrids, deployment, serialization, and much more. You will learn how the flexibility and richness of WPF makes it possible to create applications unlike any you could create previously. You will go on to explore WCF including fundamentals, configuring, securing and deploying.